The stork has arrived! Meet the new bundle of joy. 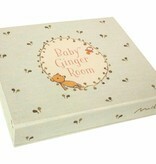 Pop open the box to reveal the nursery with a chair change of clothes with a hanger, swaddling bag and diaper.